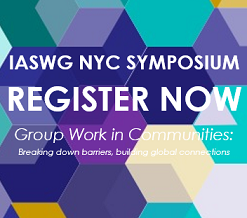 Since 1979, the International Association of Social Work with Groups has met for an annual symposium. These symposia have provided opportunities for the membership of IASWG to meet others interested in and committed to the use of groups in social work, to hear and consider new approaches to social work with groups, to socialize, to help shape the present and the future of social group work in social work and in social work education, and to participate in decision making that directs the business of the Association. Annual symposia have been held across the United States, in Canada, and in Germany. Attendance may vary but enthusiasm does not wane. Those who have attended a symposium are likely to say that IASWG symposia have a special feel about them, testament to the belief that group workers know how to have fun! Following each symposium, proceedings are produced that reflect the kinds of ideas and issues current in the field at that time. Past proceedings can be found in the Resources section of this website, or check out our proceedings publisher. Group Work in Challenging Times: Creative Strategies for Facing Change: In an increasingly adversarial and complex world that affects our lives on so many levels, group work has taken on an even greater importance. Those of us committed to group work know what a powerful resource it can be for addressing and often healing the misunderstandings and conflicts that underlie difference in all its forms. IASWG exists, and our mission as group workers is, to keep group work wisdom and practice alive and thriving so that people, groups, communities, and the planet can change, survive, and flourish. Group Work across the Globe: Building Transformative Connections:In a world that has become increasingly interdependent and global, where communication is frequently defined by technology, with less emphasis on real-time human conversation, our mission as group workers is to create connections between human beings in order to increase supports, share diminishing resources, build and strengthen community with multicultural awareness and competence. Group Work: Creating Space for All Voices: With its roots in the Settlement House movement, group work has proudly embraced the tradition of creating a space for all voices. Group workers today continue to advance this tradition. With a focus on mutual aid, empowerment, respect for diversity, equal participation, inclusion, and non-judgmental acceptance, group workers deter oppression by widening the circle to create a space for all voices. Unity in Diversity: Embracing the Spirit of Group Work: Located in Calgary, Alberta, Canada, June 5 - 8, 2014, the XXXVI Annual Symposium of the International Association for Social Work with Groups hosted by the Faculty of Social Work at the University of Calgary. Calgary is located near the scenic Canadian Rockies, Banff, Lake Louise, and Lake Kananaskis. All Calgary Symposium attendees will have the opportunity to spend Saturday afternoon and evening in Banff! We welcome students, faculty, agency administrators, practitioners of various disciplines, and community workers and developers who utilize the group modality to submit papers, workshops, posters, and other innovative presentation formats. 2012 - #34 – Long Island, NY, USA: Tully, G., Dolan-Reilly, G., Bacon, J., Lo Re, A. (2012) Group work: An international conversation highlighting diversity in practice. Proceedings of the 34th International Symposium on Social Work with Groups, London: Whiting and Birch. 2011 - #33 – Long Beach, CA, USA: Lee, C. (2011) Social group work: We are all in the same boat. Proceedings of the 33rd International Symposium on Social Work with Groups, London: Whiting and Birch. 2010 - #32 – Montreal, Quebec, CA: Dufault, S.F., Roy, V., Berteau, G. (2010). Strengthening social solidarity through group work: Research and creative process. Proceedings of the 32nd International Symposium on Social Work with Groups, London: Whiting and Birch. 2009 – #31 – Chicago, IL, US: Bergart, A., Simon, S. R., & Doel, M. (2009). Group work: Honoring our roots, nurturing our growth. Proceedings of the 31st International Symposium on Social Work with Groups, London: Whiting and Birch. 2007 – #29 – Jersey City, New Jersey, US: Tully, Greg, Palombo, Susanne, & Sweeney, Kathy, eds. 2012. Groups: gateways to growth. London, England: Whiting & Birch. 2006 - #28 - San Diego, CA, US: Moyse Steinberg, Dominique, ed. 2010. Tuning in and orchestrating the power of groups: Beginnings, middles, and endings (Overture, movements, and finales. London, England: Whiting & Birch. 2005 - #27 - Minneapolis, MN, US: Kuechler, Carol, ed. 2010. Group Work: Building Bridges of Hope. London, England: Whiting & Birch. 2004 - #26 - Detroit, MI, US: Lamont, Alice, ed. (2010). Group work reaching across boundaries. London, England: Whiting & Birch. 2003 - #25 - Boston, MA, US: Cohen, Marcia; Berman-Rossi, Lucia; & Fischer-Engel, eds. Holly 2010. Creating connections: Celebrating the power of groups. London, England: Whiting & Birch. 2002 – #24 - New York City, US: Carol S. Cohen, Michael H. Phillips and Merdith Hanson, Editors. 2009. Think Group: Strength and Diversity Through Group Work: Routledge. 2001 – #23 - Northeast Ohio, US: Claudia J. Carson, Anna S. Fritz, Elizabeth Lewis, John H. Ramey, and David T. Sugiuchi, Editors. 2004. Growth and Development Through Group Work. New York: The Haworth Press, Inc.
2000 – #22 - Toronto, Ontario, CA: Nancy Sullivan, Ellen Sue Mesbur, Norma C. Lang, Deborah Goodman, and Lynne Mitchell, Editors. 2003. Social Work with Groups: Social Justice Through Personal, Community, and Societal Change. New York, The Haworth Press, Inc.
1999 – #21 - Denver, Colorado, US: Sue Henry, Jean East, and Cathryne Schmitz. Editors. 2002 Mining the Gold in Social Work with Groups. New York: The Haworth press, Inc.
1998 – #20 -Miami, Florida, US: Timothy B. Kelly, Toby Berman-Rossi, and Susanne Palombo, Editors. 2001. Strengthening Resilience Through Group Work. New York, The Haworth Press, Inc.
1997 – #19 - Quebec City, Province of Quebec, CA: Separate French and English volumes. Plenary papers are the same (in English or French according to the language of the volumes), other selected papers are in their original French or English in the respective language volumes. French: Sous la direction de René Auclair, Jocelyn Lindsay et Daniel Tourette. 1997. Groups Symposium 1997. Volume 46, Numéros 2 et 3, 1997, Service Social. Publication Officielle de l’École de service social (faculté des sciences sociales) de l‘Université Laval. Quebec. English: Jocelyn Lindsay, Daniel Tourette, and Estelle Hopmeyer, Editors. 2003. Crossing Boundaries and Developing Alliances Through Group Work. New York, The Haworth Press, Inc.
1996 – #18 - Ann Arbor, Michigan, US: Harvey Bertcher, Linda Farris Kurtz, and Alice Lamont, Editors. 1999. Rebuilding Communities: Challenges for Group Work. New York: The Haworth Press, Inc.
1995 – #17 - San Diego, California, US: Joan K. Parry, Editor, 1997. From Prevention to Wellness Through Group Work. New York: The Haworth Press, Inc.
1994 – #16 -Hartford, Connecticut, US: Albert S. Alissi and Catherine G. Corto Mergins .1997 Voices from the Field: Group Work Responds. New York: The Haworth Press. 1993 – #15 - New York City, US: Roselle Kurland and Robert Salmon, Editors. 1995. Group Work Practice in a Troubled Society: Problems and Opportunities. New York: The Haworth Press, Inc.
1992 – #14 - Atlanta, Georgia, US: Benj. L. Stempler, Marilyn Glass, with Christine M. Savinelli, Editors. 1996. Social Group Work Today. And Tomorrow: Moving from Theory to Advanced Practice. New York: The Haworth Press, Inc.
1991 – #13 - Akron, Ohio, US: Marvin D. Feit, John H. Ramey, John S. Wodarski, and Aaron R. Mann, Editors. 1995. Capturing the Power of Diversity. New York: The Haworth Press, Inc.
1990 – #12 -Miami, Florida, US: David Fike and Barbara Rittner, Editors. Working from Strengths: The Essence of Group Work. Center for Group Work Studies. Out of print. 1989 – #11 - Montreal, Quebec, CA: With editorial Assistance of Jocelyn Lindsay and Jean-Pierre Landriault. Innovation – Tradition: Social Work with Groups and the Challenge of Change: Le service social des groupes et le défi dechangement societal. Montreal: The Coordinating Committee of the 11th Annual Symposium on Social Work with Groups. Two volumes. Papers printed in original English or French as presented. 1988 – #10 - Baltimore, Maryland, US: Paul H. Ephross, Stanley Wenocur, and Thomas V. Vassil, Editors. 1993 Social Work with Groups: Expanding Horizons. New York: The Haworth Press, Inc. Also published as Social Work with Groups, Volume 16, Numbers 1/2 1993. 1987 – #9 – Boston, Massachusetts, US: James A. Garland, Editor. 1992. Reaching Out: People, Places and Power. New York: The Haworth Press, Inc. Also published as Social Work with Groups., Volume 15, Numbers 2/3, 1992. This book is available at Amazon.com. 1986 – #8 -Los Angeles, California, US: Marie Weil, Kenneth Chau, and Dannia Sutherland, Editors. 1991. Theory and Practice in Social Group Work: Creative Connections. Published as Supplement #4 to Social Work with Groups. New York: The Haworth Press, Inc.
1985 – #7 - New Brunswick, New Jersey, US: Marcos Leiderman, Martin L. Birnbaum, and Barbara Dazzo, Editors. 1988. Roots and New Frontiers in Social Group Work. Published as Supplement #3 to Social Work with Groups. New York: The Haworth Press, Inc. Out of print. 1984 – #6 - Chicago, Illinois, US: Joseph Lassner, Kathleen Powell, and Elaine Finnegan, Editors. 1987. Social Group Work: Competence and Values in Practice. Published as Supplement #2, Social Work with Groups. New York: The Haworth Press, Inc.
1983 – #5 - Detroit, Michigan, US: Marvin Parnes, Editor. 1986. Innovations in Social Group Work: Feedback from Practice to Theory. Published as Supplement #1, Social Work with Groups. New York: The Haworth Press, Inc. Out of print. 1982 – #4 - Toronto, Ontario, CA: Norma C. Lang and Christine Marshall, Editors. 1983. Patterns in the Mosaic: Patterns and Issues in Contemporary Practice: Purpose, Context, and Technology. Toronto: Committee for the Advancement of Social Work with Groups. 2 volumes. This was out of print but then reprinted. Check for availability from the Faculty of Social Work, University of Toronto, 246 Bloor Street West, Toronto, ON M5S 1A1. 1981 – #3 - Hartford, Connecticut, US: Norman N. Goroff, Editor. 1983. Reaping from the Field – From Practice to Principle. Hebron, Connecticut, Practitioners Press. 2 volumes. Out of print. 1980 – #2 -- Arlington, Texas, US: Paul H. Glasser and Nazneen S. Mayadas, Editors, 1986. Group Workers at Work: Theory and Practice in the ‘80s. Totowa, New Jersey: Rowman and Littlefield. 1979 – #1 – Cleveland, Ohio, US: Sonia Leib Abels, and Paul Abels, Editors. 1981. Social Work with Groups: Proceedings 1979 Symposium. Louisville, Kentucky, Committee for the Advancement of Social Work with Groups. Out of print. 2003 – Boston: Albert S. Alissi, Heinz J. Kersting, & Bill Cohen / Haworth Press, Inc. Ask anyone who has ever been to an IASWG Symposium, you are likely to hear that these events have a special feel about them. That is true! This “special feel” has been carefully crafted and nurtured over 35 years of careful consideration to ways of keeping the spirit of group work alive. This “deconstructed” Guidebook is an attempt to record those norms and traditions so that each local planning team has some guidance for blending the Association’s carefully crafted brand with the flavor of your local vision. Most important is that planning be under-stood as a collaboration – between IASWG International as reflected by its board of directors and local planners. That said, it is also important that all planning efforts be understood as occurring on behalf of IASWG – in short, an IASWG event that carries forward the mission, goals, and objectives of the Association. In the end, even with the integration of local flavor, attendees must recognize it as an IASWG event. Many policies, tasks, and procedures are central to any IASWG symposium, making it obviously useful to have a resource. This Guidebook and the Symposium Planning Committee are primary resources, followed by the Executive Committee, the full Board of Directors, and ultimately, even those who have undertaken the task in the past. There is no shortage of wisdom and experience to help move the planning process forward and to help blend the cherished and well thought out policies and preferences with the unique qualities of a local venue. Over the years, this Guidebook (now deconstructed into several hopefully easily accessible components), has undergone many changes, the latest of which are the use of technology to centralize processes and standardize many materials, all intended to prevent local planning groups from reinventing expectable annual “wheels.” Any questions – of course, always ask the Symposium Planning Committee (SPC), which is the primary support and resource. The major components of producing an IASWG Symposium are: selecting/securing a venue (conference venue and accommodations), stylizing and promoting the Symposium (garnering local support and co-sponsors, creating a locale-specific Call for Proposals), developing the structure (creating tasks forces, assigning roles, setting up finances, etc. ), preparing the program (organizing sessions, speakers, exhibitors, etc. ), hosting the event (developing the use of space, coordinating chairs and volunteers, etc. ), and publishing a set of Proceedings that reflect the “best of the best” presentations (generally assumed as plenaries and invitational sessions if in written form and selected/reviewed papers that reflecting the theme’s range. We recognize and thank Roselle Kurland, a founding member of IASWG, who wrote the first edition of this Guidebook. No wonder the attention to planning is so comprehensive!